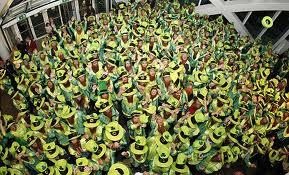 OH BEGORRA….DONEGAL AIMING TO SMASH WORLD LEPRECHAUN RECORD! A VERY SMALL EXCLUSIVE: A Donegal town is planning to beat a unique world record by having the most number of leprechauns in one place! Glenties is renowned for having one of the most colourful St Patrick’s Day parade in the entire country. But this year it plans to be even more special by planning to smash the Guinness Book of World Record for the most number of leprechauns. The current record stands at 262. But Glenties Community Action Group plans to smash that and are in the process of making a whopping 450 leprechaun outfits. The group has already been officially accepted by the Guinness Book of World Records to go for the record. Chairperson of the Glenties Community Action Group, Carmel Doherty told Doneghaldaily.com “We plan to smash the current record out of the water. “We are getting people to sign up and give a commitment they are going to be there. It’s going to be huge,” she said. The group is already working with the Inishowen Carnival group to build a massive St.Patrick, a dragon and many other floats. Anyone who wishes to take part in the parade or become a leprechaun for the day can call into Bonnar’s Dresmaking Shop or Keeney’s Bar on the Main Street in Glenties.